A beautiful rich curry laden with spices. OK, so my love affair with Indian began several years ago when a friend of mine organised a cooking class with Ajoy Joshi, he of Nilgiri’s restaurant fame. At his restaurant he changes the menu every three months to showcase all the regions of India. His food is complex, delicate, sophisticated and delicious. He is a LEGEND in terms of dragging the India food scene in Australia forward by a hundred years. On top of that, he is THE MOST lovely guy. Anyway, his cooking class completely demystified Indian food for me and I was hooked. Now forget the cloying butter chicken from the bain marie and brace yourself for something from a different realm. This recipe takes time and there is a huge list of ingredients. I break it down, marinating the chicken the day before and then making the sauce and assembling the dish the next day. You can make it as hot or as mild as you like, I tend to put in the full amount of chilli powder in the marinade and then less chilli powder and green chilli in the sauce so it’s more palatable to all the kids. Embrace the mis en place. Get everything ready before you start cooking. I measure out the spices into a little saucer/dish so when it comes to adding them it’s just put it all in from a dish rather than farnarkling around with teaspoon measures. Prepare the garlic and ginger in bulk. I have one of those mini blitzing bowl things (technical term) that attaches to my stick blender. I peel a whole head or two of garlic, blitz it and then put in a ramekin. Ditto for a piece of ginger. Even if you have some left over, cover what’s left with a layer of olive oil, wrap in clingfilm and keep it in the fridge. Sorted. Use your food processor to chop the onions and blitz the tomatoes. When I say cook the onions for 20 minutes I really mean it – they need to be a deep caramel colour. The main thing to remember here is to just take your time, the end result is totally worth it. 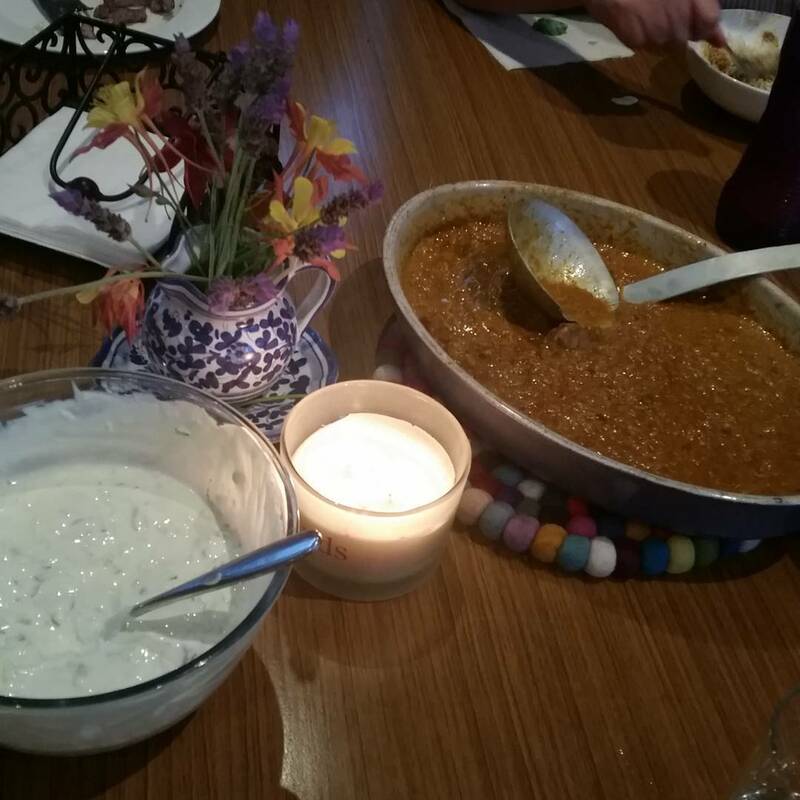 I think it’s impossible to photograph a curry without it looking like a bucket of sick, but this special, #everyfuckingnight, 2-day in the making, birthday dinner request butter chicken is freakin’ sensational. Combine the coriander seeds, cinnamon, cardamom and cloves in a frypan and heat until fragrant. Season with salt, add the chicken and refrigerate for 30 minutes - or overnight, depending on how much time you have. Heat the oil and butter over medium-low heat and add the onions and salt. Serve with cucumber raita, papadums and naan.